Yesterday, I finished one more rotation around Sol. I received hugs and kisses and my day was good, but sometimes I forget the little blessings I have around me. My Little One reminded me of one. 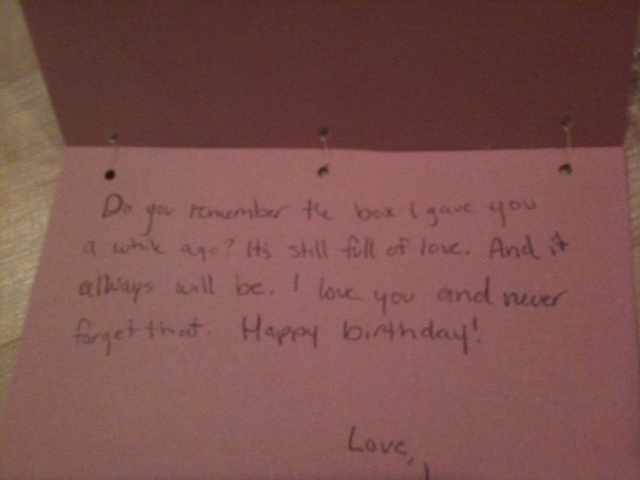 She made me a card, and reminded me that her gift is still full of love. Forgive the crappy picture, since I took it while I was bawling my eyes out. Also, my phone camera is crappy, as well. Sometimes, even at my lowest points, I need to make the effort to remember my blessings, no matter how small. We all do. What Are You *Really* Looking For?